Now that I'm really determined to adopt a healthy habit, I am always on a look out for ways on how could I possibly eat a variety of veggies with much delight. I would admit, I seldom eat veggies out of having the thoughts that my body needs it for additional health benefits but the enjoyment of eating the food is not really there. Of course, I wanted to be healthy and at the same time enjoy the foods that I take. 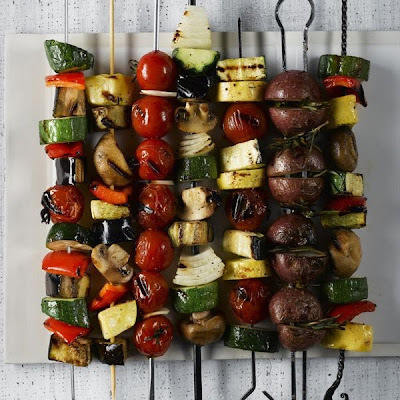 Now, I'was able to read an article where veggies are grilled to perfection. Adding some spices such as garlic powder and black pepper plus a dash of olive oil makes the vegetable dish more appetizing. I think this simple trick will also work for my daughter who really doesn't like to eat vegetables that much. She's a great fan of meat and so, I am thinking of marinating vegetables the way I do for meats and hoping that somehow, it could bring out more flavor to the veggies and entice my daughter to eat these more often. I would also be on look out for more vegetable recipes with much emphasis to grilling and steaming as these are the more healthy ways of cooking foods. Cheers to a healthy life style! First time ko makakita ng ganitom Teh Krizz! MAsarap ba sya? Ginugutom tuloy ako. Hehehe! Sarap ng veggies!